Life offers few experiences in which your 50th time is equally as exhilarating as your first. 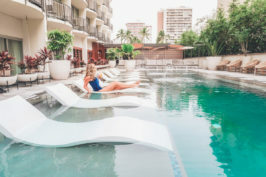 While most captivating experiences tend to lose their allure after several successions, there are some beautiful things in life that, really, never get old. You know, those life events that never cease to amaze you, no matter how many times they occur (like getting married – I would assume, or taking that first bite of pizza). For me, swimming with wild dolphins is among the aforementioned elite group of memorable encounters. No matter how many times I get blind-sided by a bottlenose (metaphorically speaking) while out snorkeling, I always revert to an awestruck little girl who’s encountering a marine mammal for the first time. 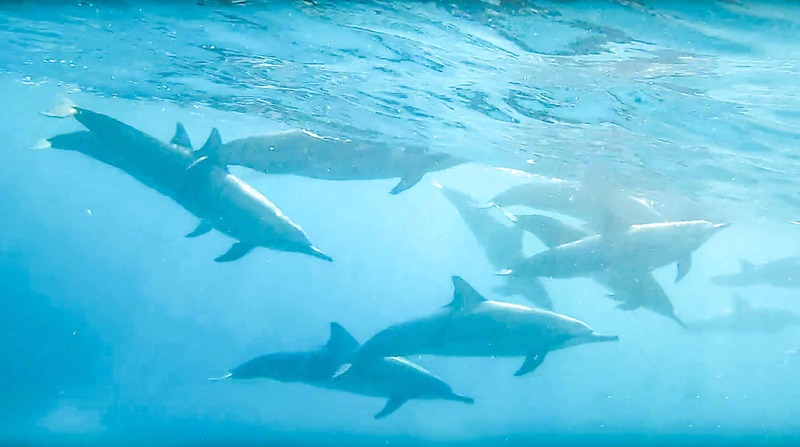 Swimming with dolphins in Hawaii is the dream of many visitors. Since responsible travelers know to avoid captive dolphin encounters (because… The Cove), we need to do it the old fashioned way, e.g. stalk them through the ocean. Fortunately, in Hawaii this isn’t as daunting as it sounds. Dolphins can be found swimming in the waters off the Big Island (Hawai’i Island) year-round. Usually calm, clear and packed with marine life, the west side (Kona side) of the Big Island offers some of the best snorkeling in the state. 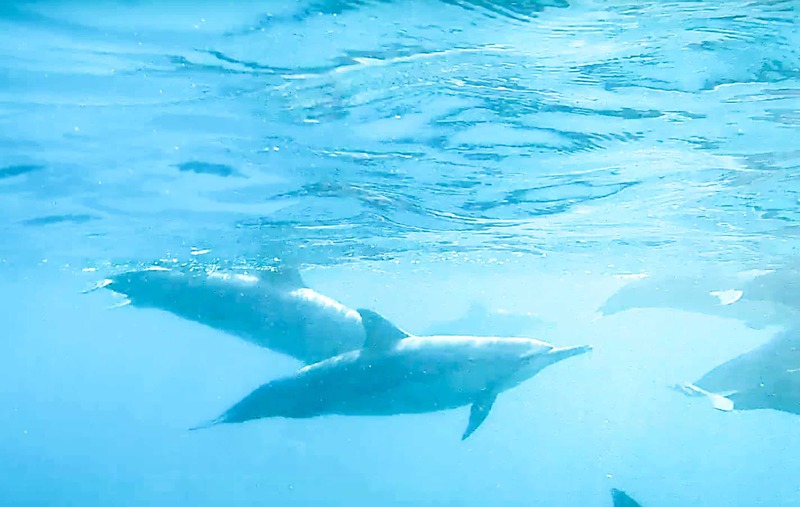 Moreover, dolphins habitually cruise the bays at some of our favorite snorkeling spots, making it fairly convenient to find them. 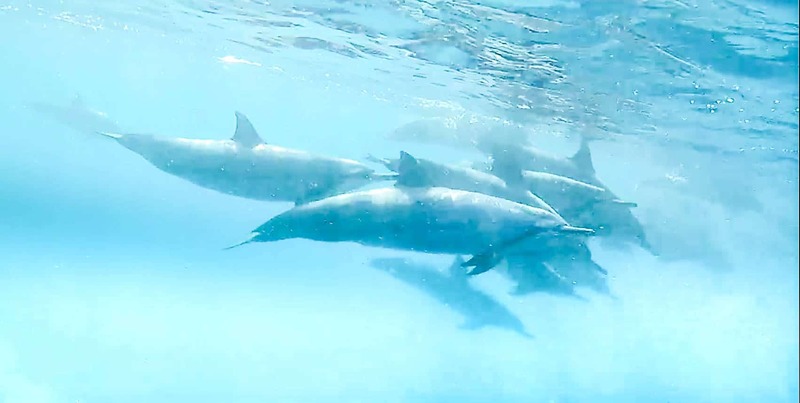 In fact, the Big Island is the only place in the state where swimming with dolphins is not only possible, but fairly easy to do (save for Oahu’s Waianae Coast). Kealakekua Bay is the largest deep water bay in Hawaii and boasts a beautiful underwater marine sanctuary. The bay’s water is calm and clear making it ideal for snorkeling, and a large number of spinner dolphins and sea turtles reside here. Some would argue that Kealakekua Bay offers the best snorkeling in Hawaii. Sounds perfect, right? Well here’s the caveat: accessing this water waterland can be tricky. You can swim it (bad plan). It’s about a 1.5 mi swim and would take strong swimmer an hour each way. Doable, yes. Ideal, no. You can hike down via the trail head near the intersection of Highway 11 & Napoopoo Rd. The hike is 2 miles (each way) with a 1,300-foot constant descent to the water. If you go this route don’t burn all your energy while snorkeling, you’ll definitely need it for the hike back up. Lastly, you can take one of the snorkel boat tours. For this particular bay, a tour may be your best bet. If you don’t want to make the trek to Captain Cook (Kealakekua Bay) but still want to enjoy some of the best snorkeling on the island, head over to Honaunau Bay. The famous snorkeling spot here is called Pae’a, but commonly known as “Two Step.” The nickname refers to an area of lava rock that has been worn by the surf to form two convenient natural steps into the water (you will find these steps at the far left of the lava rock shelf). Most mornings you will find dolphins swimming in the calm waters of the bay. 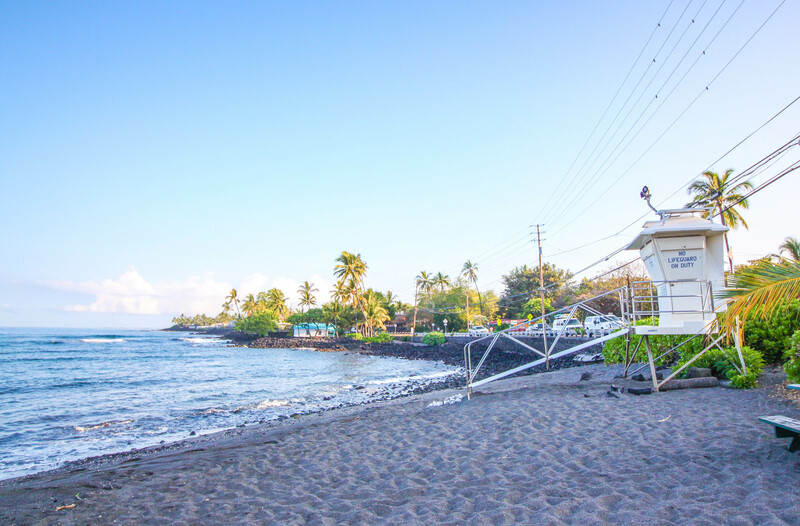 One of the nicer snorkeling spots on the Big Island, Kahalu’u Beach Park offers more variety of sea life than any other (easily accessible) spot in Kona. 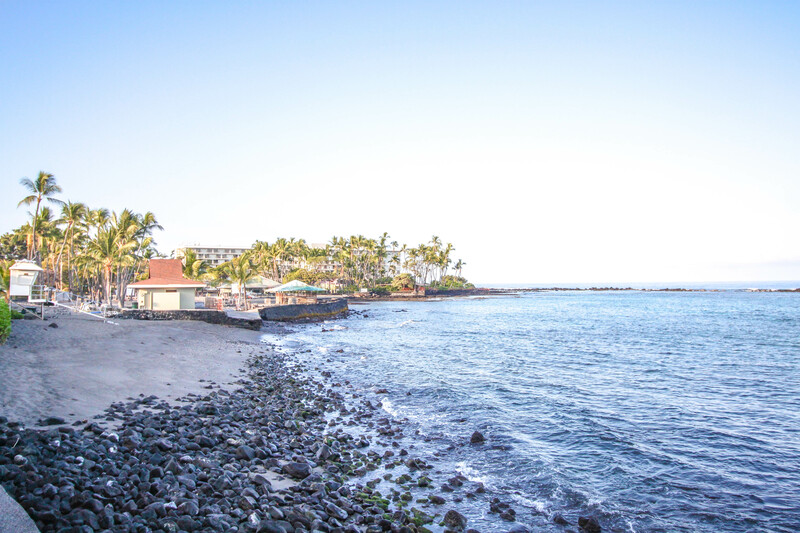 This is a great beach for families, as the bay is well protected by a lava breakwater, and the water is clean and shallow. 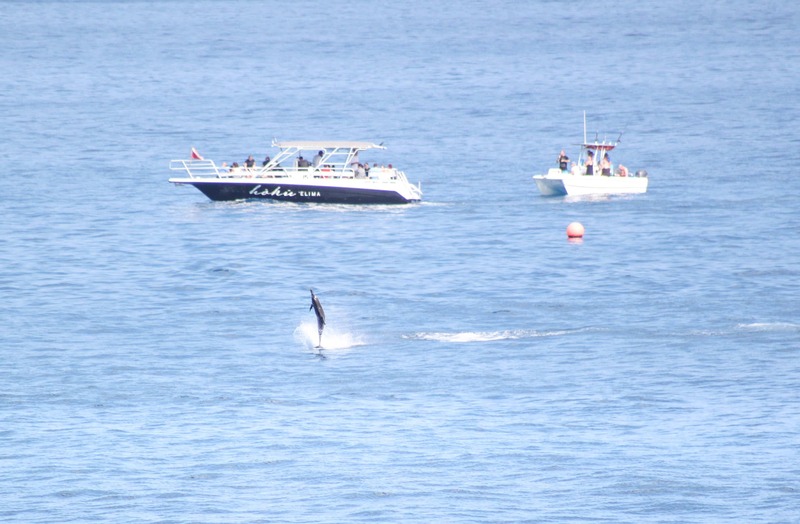 Dolphins can occasionally be spotted just past the breakwater, while turtles surround the lava rocks close to shore. Tip: If there’s high surf, swim with caution. Large waves wash over the reef and create a strong rip current towards the north end of the bay. Dolphins are most frequently spotted in the morning hours, so the earlier you get to your dolphin destination, the higher your chances of dolphins actually being there. Plus, most beaches and bays will be less busy in the morning hours – which is another added benefit. if dolphins are further out, you will need more than snorkel gear to get close. Consider renting a kayak or SUP, which will allow you to venture further from the shore. 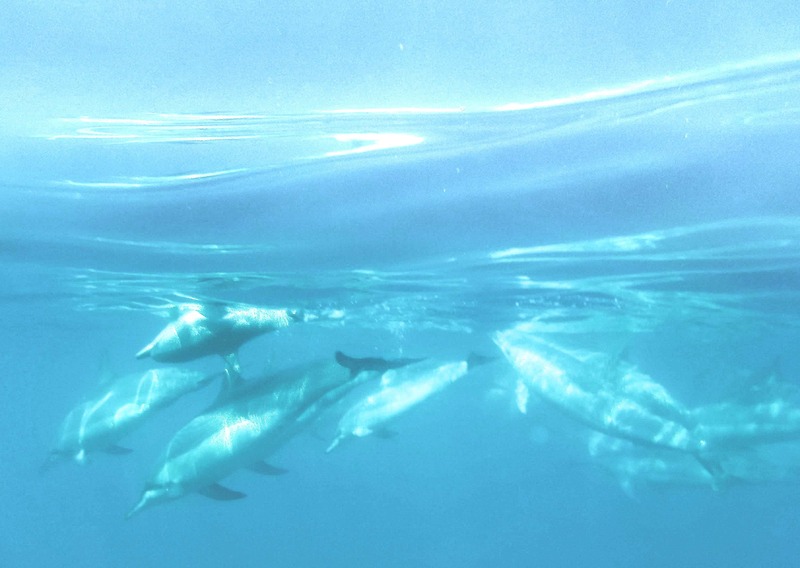 The snorkel boats often follow the dolphins, so if you’re driving past a bay and you notice a congregation of boats, there’s a high likelihood you’ll also see dolphins. If/when you find yourself swimming with dolphins, remember to stay calm, stay still, and observe them passively. Don’t take matters into your own hands and try to follow them around the bay. Chasing them will cause any nearby dolphins to swim away or dive down into deeper water. The best thing to do is just float on the surface and let them come to you. They will come much closer to the snorkelers who don’t try to pursue them. If you don’t want to take a chance on the above dolphin hangout spots, your best bet would be to book a tour. 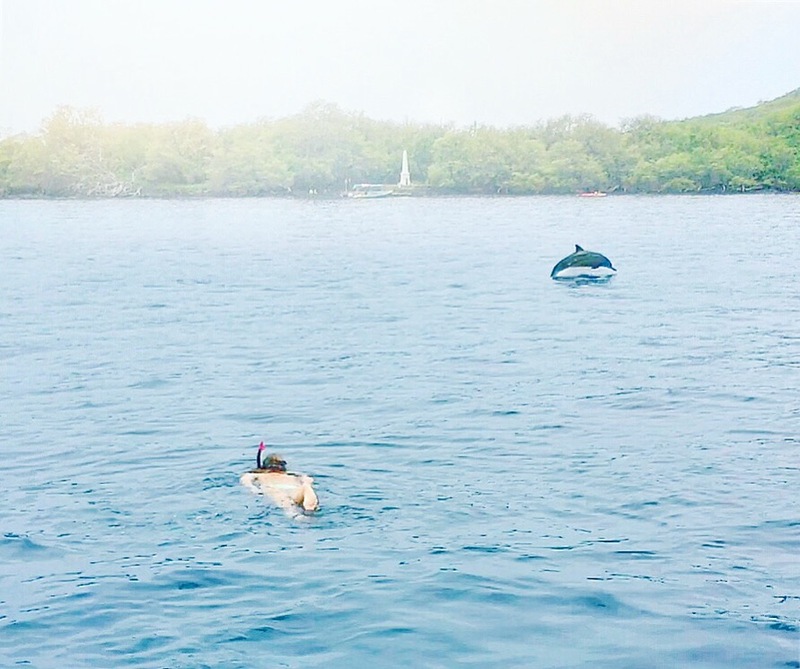 Although paying for a snorkel tour isn’t the only way to swim with dolphins on the Big Island, it definitely increases your chances.Getting away from the shore with a guide who knows dolphin’s behaviors is an (almost) sure way to encounter wild dolphins. If you are lucky enough to share a bay with dolphins, please remember they are wild animals and should be treated as such. Respect their space and try to stay 50 yards away. This is getting me so excited to go to hawaii! did you guys go to any other islands? Those all sound amazing! I can’t believe how many dolphins you saw, wow!! 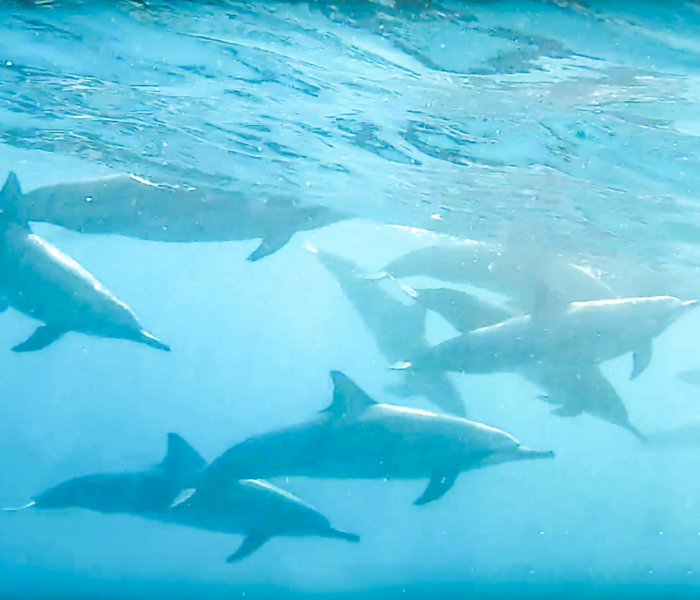 We snorkeled at Hanauma Bay in Oahu and saw some wildlife which was incredible, but I can’t even imagine doing it with dolphins! WOW! Amazing photos! 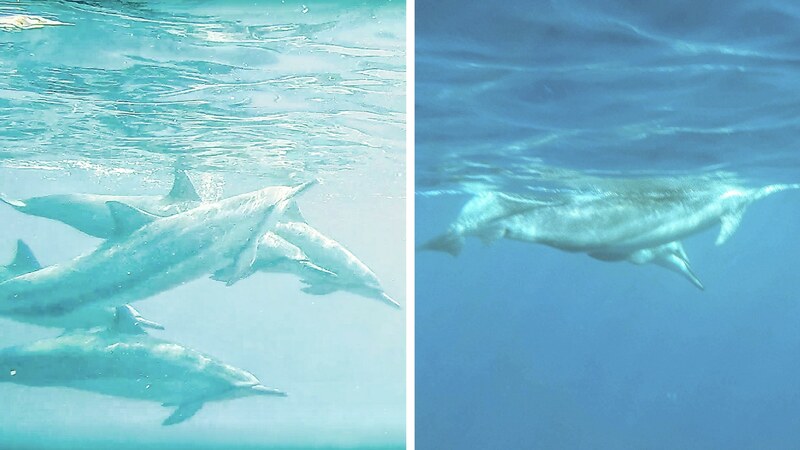 I’ve snorkeled in a few hot spots on different Hawaiian islands and we had a small school of dolphins swim near us at Kealakekua Bay, but nothing like the amount in these photos. So cool! 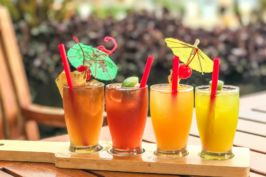 During our first trip to the Big Island, our plan was to rent kayaks and kayak across Kealakekua Bay and snorkel, but a bout of food poisoning put a wrench in our plans. It’s on the list for next time. It sounds incredible! Dolphins! So amazing! 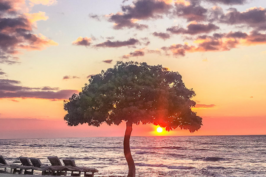 I went to Big Island about 8 years ago and I remember waking up at sun rise one day as I was jet lagged and heading out to the beach and seeing them! They were just right there leaping out the water. I would give anything to have swam with them! One day I’ll go back! Wow, you saw so many dolphins! I would love to visit Hawaii and try swimming with dolphins. Thanks for the detailed guide. Those are some great tips! I have never had the chance to swim with the dolphins but it’s on my bucket list. Hawaii is so beautiful, you’re making me want to go back! It’s also a dream of mine to swim with dolphins! Saving this post for future reference ???? ???? I’ve done this as well! It ended up being the last year you could just drive down early morning and rent a kayak for a half day right at the bottom of the road at Kaelakekua Bay. We swam with pods and pods of spinner dolphins, with some sea turtles mixed in. In some of my pictures, they were so close all you can see is grey and looks like a picture taken by mistake. They came right up to us and swam all around, the best is when they swim right under you, a foot or two away.! One of life’s absolute best memories!